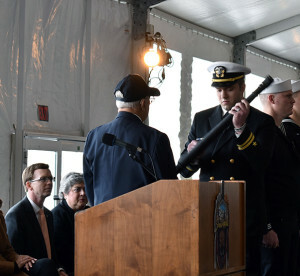 Richard Hackley, a veteran who served aboard the battleship USS South Dakota (BB 57), passes the long glass to Lt. Benjamin McFarland, the first officer of the deck to stand duty aboard the submarine South Dakota, during the boat’s commissioning ceremony at Naval Submarine Base New London, Feb. 2, 2019. South Dakota is the U.S. Navy’s 17th Virginia-class attack submarine and the third ship named for the State of South Dakota. USS South Dakota (SSN 790) became the newest and 17th Virginia-class fast-attack submarine in the U.S. Navy during her commissioning ceremony at Naval Submarine Base New London, Conn., Feb. 2, 2019. South Dakota Gov. 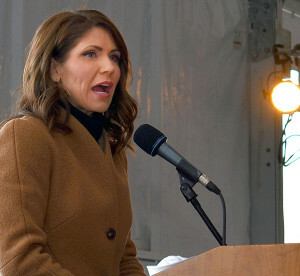 Kristi Noem delivers remarks during the commissioning ceremony for the Virginia-class attack submarine USS South Dakota (SSN 790) at Naval Submarine Base New London, Feb. 2, 2019. South Dakota is the U.S. Navy’s 17th Virginia-Class attack submarine and the third ship named for the State of South Dakota. 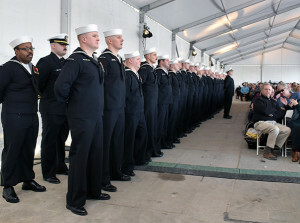 The crew of the Virginia-class attack submarine USS South Dakota (SSN 790) stands ready to assume duty during the boat’s commissioning ceremony at Naval Submarine Base New London, Feb. 2, 2019. South Dakota is the U.S. Navy’s 17th Virginia-class attack submarine and the third ship named for the State of South Dakota. The submarine is 377 feet long, has a 34-foot beam, and will be able to dive to depths greater than 800 feet and operate at speeds in excess of 25 knots submerged. 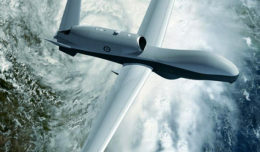 It will operate for over 30 years without ever refueling. 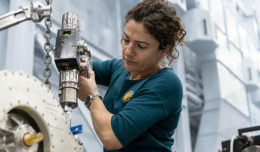 Construction on South Dakota began 2013; the submarine’s keel was authenticated during a ceremony on April 4, 2016; and the submarine was christened during a ceremony Oct. 14, 2017.